The Lizzie cotton Victorian style nightdress is inspired by the designs from the past. Full length with a round neck, comfortable high back and generous sized arm holes for comfort in bed. Delicately embroidered with white daisies on the pintucked bodice and gentle gathers. 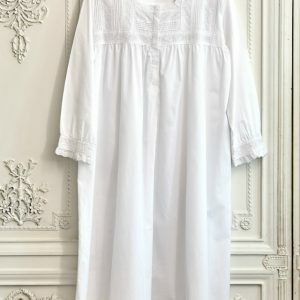 This fine cotton nightie is very light and ideal for those warm summer months.